115 Marlborough is located on the north side of Marlborough, between Clarendon and Dartmouth, with 113 Marlborough to the east and 117 Marlborough to the west. 115 Marlborough was designed by architect Charles K. Kirby and built ca. 1872, for speculative sale, one of a symmetrical pair (113-115 Marlborough) built at the same time, and one of six contiguous houses he designed in 1871-1872 (105-107-109-111-113-115 Marlborough). 113-115 Marlborough probably were built by James Henry Standish, a carpenter and builder, who built 111 Marlborough at about the same time. Charles Kirby purchased the land for 113-115 Marlborough from the Commonwealth of Massachusetts on September 3, 1872. On August 19, 1872, he purchased a seven inch strip to the east from James H. Standish, under the party wall with 111 Commonwealth, and on November 1, 1872, he sold a six inch strip to his father, James M. Standish, also a builder, under the party wall with 117 Marlborough, which he was about to build. Click here for an index to the deeds for 115 Marlborough. On January 1, 1874, 115 Marlborough was purchased from Charles Kirby by Mary Stone (Coburn) Haskell, the wife of William Andrew Haskell. They previously had lived at 6 Bond Street. William Haskell was a bedding merchant and later became an officer of the New York and New England Railroad. 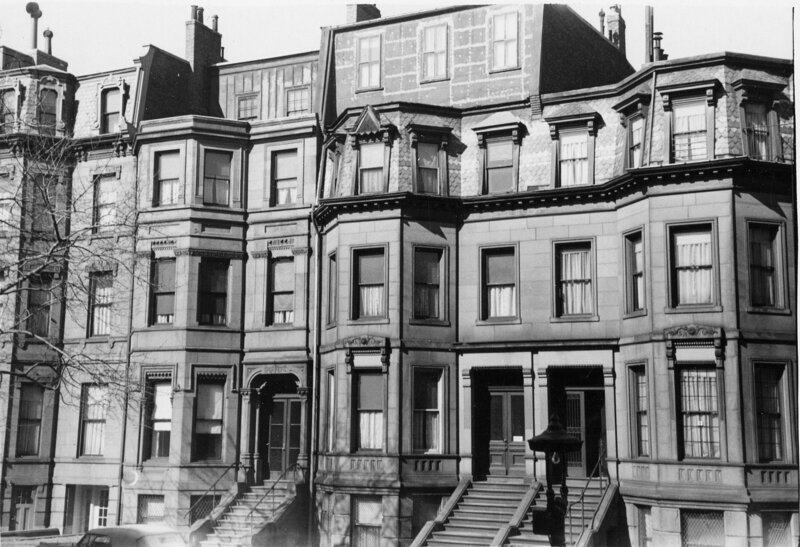 The Haskells’ two sons – William Andrew Haskell, Jr., and Coburn Haskell – were raised at 115 Marlborough. Coburn Haskell became a dental surgeon in Cleveland. He was the inventor of the one-piece rubber cored golf ball, which became widely adopted by 1901 after its use in the British and US Opens. During the 1885-1886 winter season, the Haskells were living elsewhere and 115 Marlborough was the home of dry goods merchant Robert Ferguson and his wife, Mary A. (Watson) Ferguson. They previously had lived at the Hotel Vendôme. 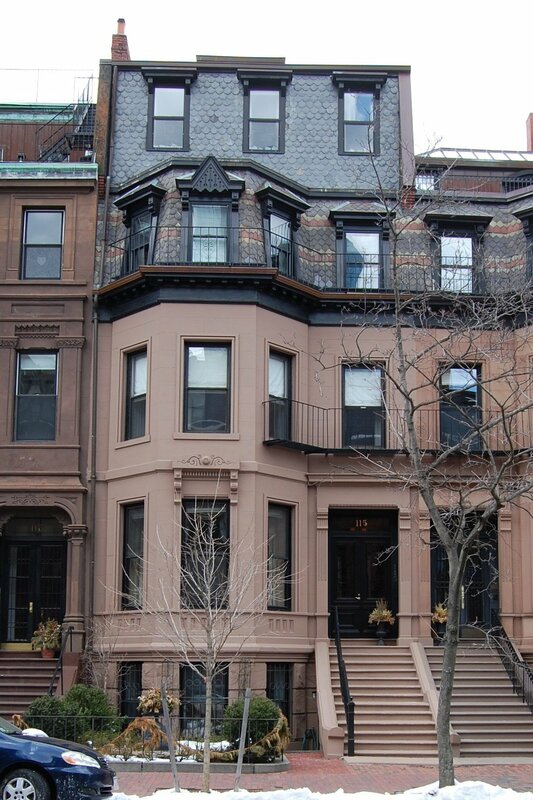 By the next season they had moved to 386 Marlborough and the Haskells were again living at 115 Marlborough. William Haskell died in March of 1891 and Mary Haskell moved soon thereafter. On October 8, 1891, 115 Marlborough was purchased from Mary Haskell by Arthur Boardman Silsbee, a banker, shipping merchant, and textile mill executive. His mother, Martha Mansfield (Shepard) Silsbee, the widow of John Boardman Silsbee, and his siblings, Martha Silsbee, an artist, and Thomas Silsbee, lived with him. They previously had lived at the Hotel Brunswick (southeast corner of Clarendon and Boylston), and before that at 117 Beacon. It appears likely that the additional story at 115 Marlborough was added at the time Arthur Silsbee acquired the house. 113 and 115 Marlborough show as the same height on the 1887 Sanborn map, but 115 Marlborough shows as one story higher on the 1897 map. Martha (Shepard) Silsbee died in February of 1911. Arthur, Martha, and Thomas Silsbee continued to live at 115 Marlborough. Thomas Silsbee died in April of 1919, and Martha Silsbee moved to 82 Chestnut in about 1921. Arthur Silsbee continued to live at 115 Marlborough until his death in April of 1924. On July 9, 1924, 115 Marlborough was acquired from Arthur Silsbee’s estate by Mary Sloan (Colt) Curtis, the wife of Louis Curtis, Jr. They previously had lived at 441 Beacon They also maintained a home in Nahant. Louis Curtis was a banker, the resident partner in Boston of Brown Bros., Harriman & Co., a position his father had held before him. From about 1934, he also served as treasurer of Woodward School at 319 Marlborough. The Curtises continued to live at 115 Marlborough in 1936, but had moved to Brookline by 1937. On October 29, 1936, 115 Marlborough was acquired from Mary Curtis by real estate dealer Ray C. Johnson. 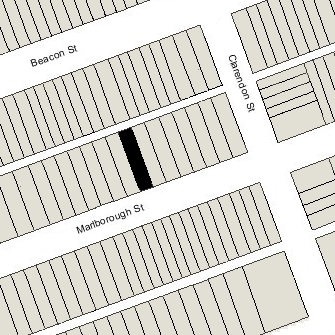 115 Marlborough was not listed in the 1937 Blue Book and was shown as vacant in the 1937 Boston City Directory. On June 25, 1937, 115 Marlborough was acquired from Ray C. Johnson by Sarah (Boocock) Simpson, the widow of James Simpson. Their son, Gordon Keith Simpson, and daughter, Margaret Ellen Simspon, lived with her. They previously had lived in Pittsfield. In December of 1937, she applied for (and subsequently received) permission to convert the property from a single-family dwelling into a lodging house. In December of 1940, Gordon Simpson purchased and subsequently moved to 186 Beacon. Sarah and Margaret Simpson continued to live at 115 Marlborough until about 1942. On March 7, 1942, the Volunteer Cooperative Bank foreclosed on its mortgage to Sarah Simpson and took possession of 115 Marlborough. On March 31, 1932, it was acquired from the bank by Warren-Stevens, Inc.
On January 7, 1946, 115 Marlborough was acquired from Warren-Stevens, Inc., by Mary Post, the wife of Charles S. Post. They lived at 115 Marlborough and operated it as a lodging house. On October 8, 1947, 115 Marlborough was acquired from Mary Post by Bernard Metz, a writer, and Josephine (Giuseppa) Giuliana. They married soon thereafter and made 115 Marlborough their home and operated it as a lodging house. On September 12, 1949, they transferred the property into his name as trustee of The Concord Trust. On February 21, 1950, Bernard and Giuseppa Metz changed their names to Bernard Mayne and Josephine G. Mayne. They continued to live at 115 Marlborough until about 1950. On March 11, 1953, 115 Marlborough was acquired from Bernard Mayne by Josephine Mayne’s parents, Salvatore Giuliana and Crocifissa (Tabbi) Giuliana. They lived in Jamaica Plain. On October 15, 1954, 115 Marlborough was acquired from the Giulianas by Nazarino Joseph Mazzola. On October 26, 1955, 115 Marlborough was acquired from Nazarino Joseph Mazzola by Miss Mary Angela Cocuzzo. They were first cousins, sharing the same maternal grandparents (Mary Cocuzzo was the daughter of Domenic Cocuzzo and Angela (Deluca) Cocuzzo, and Nazarino Joseph Mazzola was the son of Gerardo Antonio Mazzola and Maria (DeLuca) Mazzola). Mary Cocuzzo lived in Brighton with her parents and was employed by the Mazzola Market in Brighton, owned by Gerardo Mazzola. 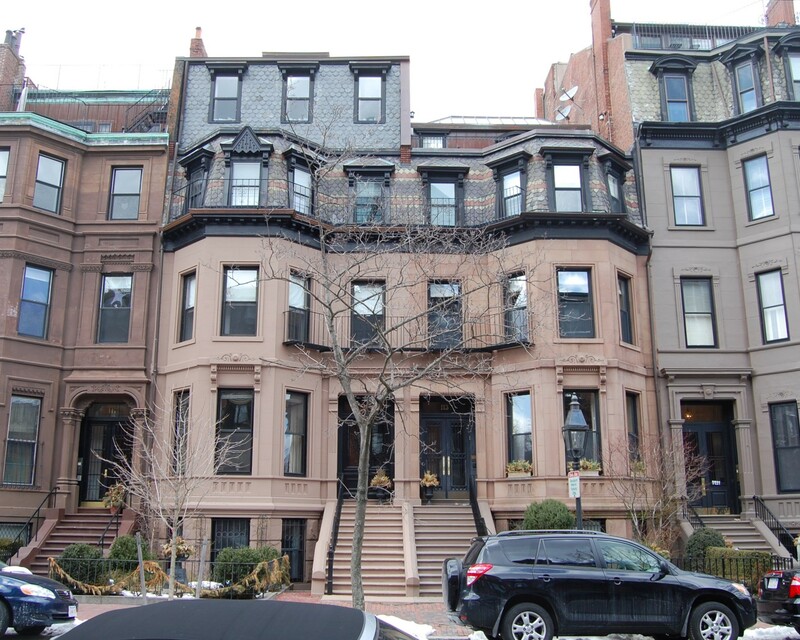 By the 1960s, she had joined with Miss Nancy A. Casey, who lived in Belmont and was an employee of the National Shawmut Bank, as owner of several Back Bay properties which they operated as lodging houses. On January 23, 1968, Mary Cocuzzo and Nancy Casey transferred 115 Marlborough and several other properties to Mary Cocuzzo’s first cousin, Francis Gerardo Mazzola, as trustee of the Mazz Realty Trust. On October 5, 1972, he transferred 115 Marlborough back to Mary Cocuzzo and Nancy Casey. It continued to be a lodging house. On November 30, 1973, 115 Marlborough was acquired from Mary Cocuzzo and Nancy Casey by Thomas J. Turner, and on February 5, 1975, he transferred the property to Roy Sylvia. On September 3, 1975, 115 Marlborough was acquired back from Roy Sylvia by Mary Cocuzzo and Nancy Casey. On January 30, 1981, 115 Marlborough was purchased from Mary Cocuzzo and Nancy Casey by James A. Magner, III, trustee of the John Alfred Realty Trust. In February of 1981, he applied for (and subsequently received) permission to convert the property from a lodging house into five apartments. On September 26, 1981, James Magner converted 115 Marlborough into five condominium units, the 115 Marlborough Street Condominium.